Barcelona’s Magic Fountain of Montjuic is a huge draw when it ‘performs’ and tourists come on bus trips from miles around to see it. 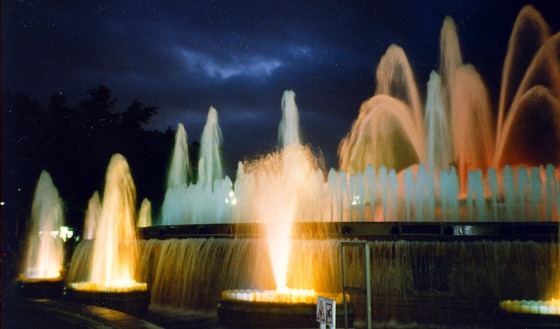 The fountain is just a short walk from Placa Espanya at the foot of Montjuic. It’s basically a music, light and water show but it doesn’t happen every night, so check out the days and times below before heading to the fountain. There is a big flight of steps which everyone sits on to get a better view. 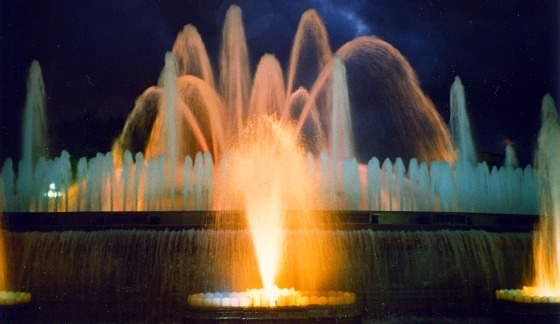 The Magic Fountain is the centrepiece of a collection of water features that you’ll find on Avinguda Maria Cristina (pictured below) between Placa Espanya and Montjuic Park. It was built in 1929 for the World Fair and has been enjoyed by visitors ever since. Until the 1980s when the music was added though, it was simply a light and water display. When you’re watching the fountain, think about the 2600 litres of water which are pumped through it every second! The fountain performs from April to October, Thursdays to Sundays at 9pm, 9.30pm, 10pm, 10.30pm and 11pm. From November to March, performances are on Fridays and Saturdays at 7pm, 7.30pm, 8pm and 8.30pm. It’s free to watch, but get there early to get a decent view from the steps. The Magic Fountain is a short walk from Placa Espanya. Take Avinguda Maria Cristina and enjoy the pleasant water features along the way (pictured above). 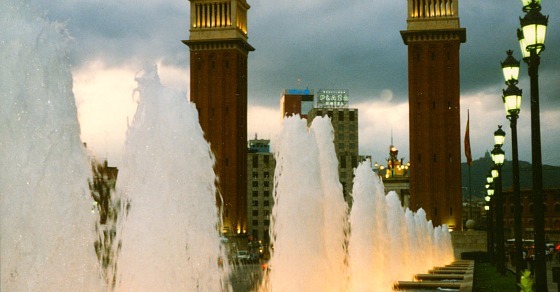 Magic Fountain of Montjuic – Official website.